Starting from 1869, the young carpenter by trade, Melvin Newton Lovell (1844-1895) from Erie, Pennsylvania, later a woodenware manufacturer and successful businessman, was granted numerous patents for various devices, between them several patents for adding machines (cash registers). 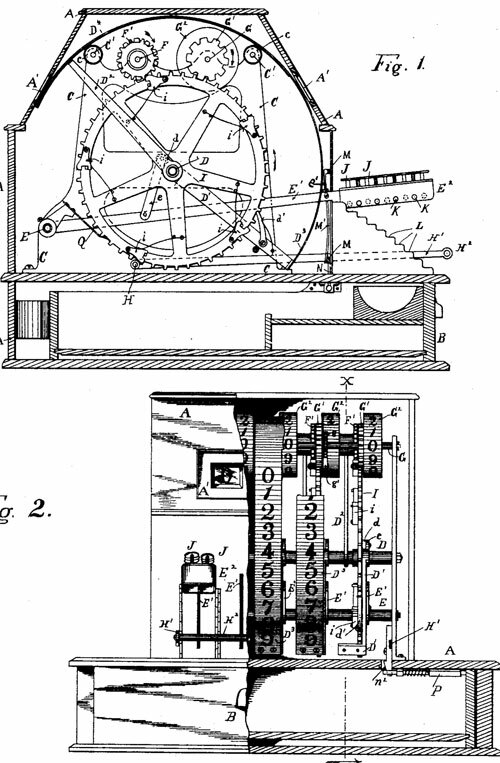 Lovell's fist patent for cash register and indicator (US445959) (see the lower patent drawing) was granted in 1891. The operation of the machine will be as follows: Let's suppose that the operator wishes to record a sale amounting to $12.56. He may do it by pressing key 1 on the left hand lever, key 2 on the next lever to the right, key 5 on the next lever to the right, and key 6 on the right-hand lever, or he may work from right to left, or he may follow no successive action, the result will be the same—the indicators will display at the openings A' in the case the figures 1 2 5 6, and on the drums inside the figures 1 2 5 6 will be on the reading-line. The operator will then depress the bar H2, which will release the levers E', and they will all resume their normal position, the indicators will all show naughts at the openings A'; but the drums (G2 in the case will stand, as above stated, with the figures 1 2 5 6 in line. If the next sale to be recorded should be $13.04, the drums G2 would be moved so as to read 2 6 2 0, which is the sum of 1 2 5 6 and 1 3 6 4, while the indicators would show at the openings A' the figures 1 3 6 4, the amount of the last sale recorded. Who was the inventor Melvin Lovell, a man of fine character and marked ability? When Melvin Lovell was a boy, the family removed to Kerrtown, a village located in the vicinity of Titusville, PA. There Melvin reared to maturity, studying at the local common schools. Meanwhile he served an apprenticeship at the carpenter's trade, and his natural mechanical talent, enabled him soon to become a skilled workman. He followed his trade during the major portion of his term of residence in Kerrtown, and also became interested in the oil fields of Titusville. In 1861, only seventeen years of age, Melvin Lovell left his home and, without parental authority, tendered his services in defense of the Union. Soon after the outbreak of the Civil war, in August 1862, he was enlisted as a private in the 127th Pennsylvania Volunteer Infantry, and with this command he saw active service until receiving his honorable discharge the end of May 1863. In 1865 he took up his residence in Erie, where he worked at the carpenter's trade for a number of years thereafter. In 1869 Melvin Lovell invented and patented several useful articles for household use, and in that year he began the manufacturing of certain of these inventions, in partnership with Franklin Farrar Adams, another inventor, and later mayor of Erie. Among the principal products of the original factory were washing machines and step-ladders. In 1881 Lovell individually began manufacturing other of his patents, including spring beds, and from a modest inception his Lovell Manufacturing Company grew to be one of the largest industrial concerns of its kind in the country, even was recognized as being the most extensive manufactory of clothes-wringers in the entire world. In connection with his manufactory Lovell established sales agencies for his products in all parts of the country, and these branches were known as the Lovell stores. From them goods were sold on the installment plan, of which now common system Lovell was practically the originator. After his business had already been established upon a substantial basis and had grown to no inconsiderable proportions, Lovell invented and patented the famous wringer which bears his name, and in later years he confined his operations largely to the manufacture of this very superior invention. In 1870 Melvin Lovell married to Elizabeth A. Nelson (15 Oct. 1846–3 Dec. 1924), born in New York City, a daughter of James and Mary A. (Gaggin) Neilson, the former of whom was born in the city of Glasgow, Scotland, and the latter in Ireland. They had 2 children: Susan May (1868-1888) and Bertha Neilson (b. 1876). Lovell was also one of the organizers and stockholders of the Combination Roll & Rubber Manufacturing Co, of New York, which was formed for the purpose of manufacturing his patents, with headquarters in New York and factory at Bloomfield, New Jersey. In 1895 Lovell was the first and most potent factor in securing the proper representation of the state of Pennsylvania at the Cotton States Exposition, held in Atlanta, Georgia, and was appointed commissioner from Pennsylvania to that exposition, where he did an enthusiastic and particularly successful work in behalf of his native state. Unfortunately, during his stay in Atlanta, he passed away in his prime, on 21 November 1895, and was buried in Erie Cemetery, Erie, PA.